You may misunderstand that hiring a personal chef will cost you a lot and it is not worth it to spend such huge money on this! This is a wrong idea. Personal chefs are now helping couples and families to present fabulous home cooked dinners to their guests. And it's not as expensive as you think! The reasons of hiring a personal chef: A personal chef will bring the food, create a nutritious and balanced meal, figure out the servings needed (so you don't need to deal with leftovers) and most of all give you the freedom to focus on other aspects of entertaining while still providing the best food for your guests. Are you hosting a business lunch? An intimate wedding reception? Or even an intimate dinner for two that just has to be the best? A personal chef can handle any order. You can usually choose from a selection of courses they provide or arrange for a customized menu. The cost: Prices will vary but you can expect a weeks worth of meals (containers, food and cooking included) to be about $350 for a family of 4 (20 meals of entrees and side dishes) or $175 for a couple (10 meals of entrees and side dishes). Some services will prepare all the meals at once while others will deliver or prepare the meal in your home throughout the week. 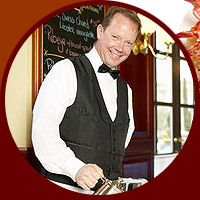 Place to hire a personal chef: Finding a chef is easy by using the USPCA (United States Personal Chef Association) or the CPCA (Canadian Personal Chef Alliance). Here you will find information on personal chefs as well as a directory of members in your area. Don't view a personal chef as a catering service. They are more professional. For busy professionals who are looking for quality meals and more time with their family, a personal chef will prepare several entrees and side dishes, store them and clean the kitchen. For the rest of the week all you have to do is take them out of the fridge or freezer and reheat to enjoy gourmet meals all week. For families who turn to fast foods and restaurants the cost may actually be less than what they are currently paying. Some personal chefs also can be booked for private or group cooking lessons. Invite a group of your friends to learn the art of creating delectable pasties or sumptuous seafood from an expert! If you want to have a wonderful time at home, relax all day, no need to wake up in the morning to do a cookery, a personal chef is the best solution for you. .